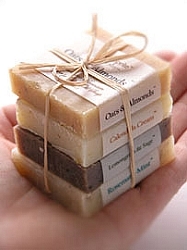 These lovely little bundles of soaps are a great way to try a selection of most popular scents! Also makes a thoughtful hostess gift, stocking stuffer, guest amenity or for any occasion. 4 - 1 oz. 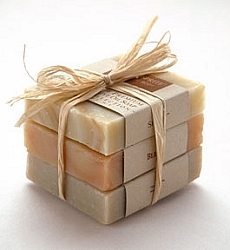 Organic Soaps, hand-tied in natural raffia. All-Star: Grapefruit-Mint, North Shore, Ginger Glow & Lavender. 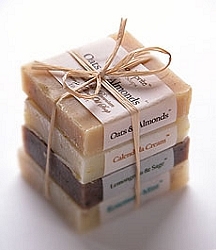 Gourmet: Oats & Almonds, Lemongrass & Sage, Calendula Cream & Eucalyptus Peppermint. 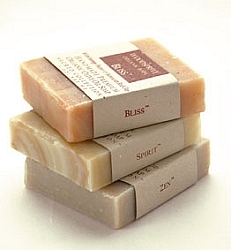 *Note: We may substitute a soap of similar type in case of out-of-stock items.